For years I have warned the greatest threat to our nation, our precious freedoms, was the left’s war on our first amendment rights. We filed suit against the social media giants — little notice was paid. As if censoring Geller was OK. No one wanted to dirty themselves with that fight. But it was never about Geller. It was about our freedom, I was merely the tip of the spear. Going on two years later, and now we have reached a tipping point which may be unrecoverable. There is conspiracy theory and conspiracy fact. This is surely the latter. I document in detail the breathtaking war on free speech in social media in my book, FATWA: HUNTED IN AMERICA. Get the book, you will be shaken. The 50-page report, “Censored! 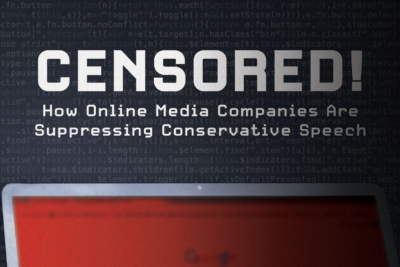 How Online Media Companies Are Suppressing Conservative Speech” examines the four largest internet entities — Google, Facebook, Twitter, and YouTube — and declares that their handling of political speech is “far more troubling than most conservatives realize.” Indeed. It lists the conservative blog Legal Insurrection, foreign policy commentator Pamela Geller, conservative columnist Michelle Malkin, video bloggers Diamond and Silk, Dennis Prager’s PragerU series, and several pro-gun channels as having seen their videos either deleted, age-restricted, or demonetized, and in the cases of Geller and Legal Insurrection, their accounts terminated entirely [after taking action, my account was reinstated]. I do not know how far my lawsuit against the social media giants will get, but I do know that something must be done. Whether through legislation or anti-trust lawsuits, the chokehold that the uniformly leftist corporate media managers at social media giants like Facebook, Twitter, YouTube, Google have on our means of communication must be broken. If the US government could break up Ma Bell, the USG can break up Facebook. Today’s IP address is yesterday’s phone number. It’s how we communicate today — whether by FB comment, messenger, Twitter DM, etc. April 17, 2018 (LifeSiteNews) — On Monday, the conservative Media Research Center released a comprehensive report detailing the suppression of conservative opinions on major social media platforms. The report finds that all four websites actively hide or deemphasize conservative content from users, and that in some cases staffers have admitted doing so was intentional. It further criticizes the platforms for relying on left-wing organizations to provide advice and screening sources that are presented as impartial. The report finds that Google, the world’s most influential search engine, displayed a “tendency toward left-wing bias in its search results.” Its lead source was a study by Robert Epstein of the American Institute for Behavioral Research and Technology, which found that search results for decided voters “were nearly twice as biased in favor of (Hillary) Clinton” in the 2016 presidential election. “Censored!” also highlights a January 2018 Project Vertias video, which filmed Twitter employees admitting that they “shadow-ban” some conservative users — a practice by which others cannot see a shadow-banned user’s content, but the target has not been notified of an action against him. Twitter has attempted to block several pro-life advertisements, as well. The report also notes that Twitter attorney Sean Edgett admitted to a House panel that during the election Twitter censored 25 percent of tweets carrying the #PodestaEmails hashtag, and 48 percent of those tagged #DNCLeak (referencing a scandal over leaked emails from the Democratic National Committee). Regarding Facebook, the report calls attention to a 2016 Gizmodo report that quoted several former employees as admitting that Facebook “routinely” manipulated its trending news feature to exclude topics such as the Conservative Political Action Conference, Wisconsin Gov. Scott Walker, and the scandal concerning former IRS official Lois Lerner. “It was absolutely bias. We were doing it subjectively. It just depends on who the curator is and what time of day it is,” one former news curator is quoted as saying. YouTube has suppressed conservative content as well, according to MRC. It lists the conservative blog Legal Insurrection, foreign policy commentator Pamela Geller, conservative columnist Michelle Malkin, video bloggers Diamond and Silk, Dennis Prager’s PragerU series, and several pro-gun channels as having seen their videos either deleted, age-restricted, or demonetized, and in the cases of Geller and Legal Insurrection, their accounts terminated entirely. Prager and Diamond and Silk’s cases are ongoing, but YouTube has since reversed most of the decisions listed here, claiming they were unintentional errors. Nevertheless, suspicions remain that the trend is due to a persistent, deliberate bias rather than occasional, benign mistakes. “Censored!” notes that each company takes advice and outsources some fact-checking and guideline enforcement to organizations that themselves have left-wing biases. Facebook’s “fact-checking” feature relies primarily on left-leaning publications such as Snopes and PolitiFact for ostensibly-impartial “fact checking,” as well (in fairness, the conservative Weekly Standard is also listed as a fact-checker). Facebook does not formally employ SPLC as part of that process, but in August 2017 it deleted 57 of more than 200 alleged “hate groups” suggested by SPLC. Google faces similar criticism. The report lists several recommendations for tech companies, including greater transparency for when and how content restriction decisions are made, publishing clear guidelines for ideological content, cutting ties with “bad actors” such as GLAAD and SPLC, employing truly neutral fact-checkers, and overhauling their algorithms, advertising policies, and systems for flagging and reporting disputed content. “The conservative movement is facing a threat to its very existence — a new, insidious form of media censorship,” Goldenberg and Gainor warned. “It’s almost too much for conservatives even to contemplate fighting. But they need to do much more than contemplate it. Ajit Pai, head of the Federal Communications Commission (FCC) Email: Ajit.Pai@fcc.gov.